Mount Kephart is the ninth-highest summit in the Great Smoky Mountains National Park, and this all-day trip approaches the peak from a seldom-used section of footpath in the heart of the park. Begin along the wide gravel path of the Kephart Prong Trail from Newfound Gap Road. The trail begins at the creekside remnants of a Depression-era Civilian Conservation Corps camp and then climbs along the rocky creek. At the Kephart shelter at 2.1 miles, fork right on Grassy Branch Trail, which travels through a gorgeous section of forest for 2.5 miles. Before reaching the crown of the Smokies, follow the Dry Sluice Gap Trail for 1.3 miles. At the crest of the park on the North Carolina/Tennessee line, go left on the Appalachian Trail and pass a trio of the high Smokies’ most famous peaks: Charlies Bunion, the Jumpoff, and Mount Kephart. The latter summit is named for the legendary folklorist, author, and early national park advocate Horace Kephart. He’d be proud: From this ridge, there’s no shortage of spectacular vistas. To wind up your day, descend the Sweet Heifer Creek Trail for 3.7 miles to the shelter and return to the parking area. Navigate: From the town of Cherokee, follow U.S. 441 north into the Great Smoky Mountains National Park. 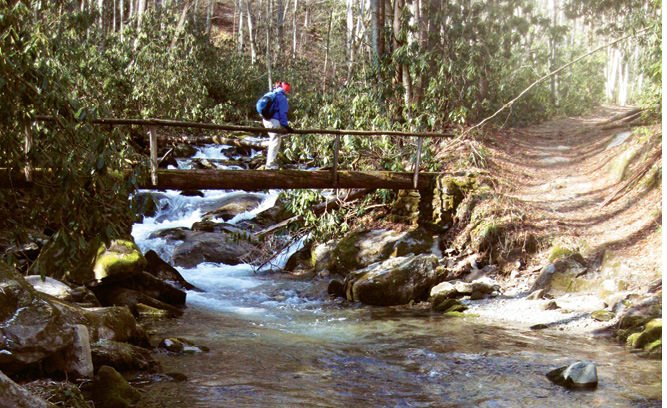 The Kephart Prong trailhead is approximately seven miles past the Oconaluftee Visitor Center.